The only thing cuter than a sweet, fluffy little puppy is a sweet talking fluffy little puppy! Meet Ramsey the adorable talking Husky. This hilarious little puppy that talks like a human has gained internet stardom. Instead of barking or howling like a normal dog, the pet pooch, named Ramsey, has got a slightly different way of communicating with his owner. This handsome fella has been delighting his humans as he struggles to tell them how much he loves them, in plain English, of course. “What was that?” His human mom asks him, laughing with delight. Ramsey yells loudly as if to answer her with an eager reply. This heartwarming video is only one example of how human-like animals can be. Dogs make especially good pets because of their adaptability and the overwhelming desire to be with their humans. With a little time and care, most dogs can easily adapt to a variety of household situations. Rest assured, no matter what communication issues arise, dogs are always trying to bridge the gap between species with love and affection. 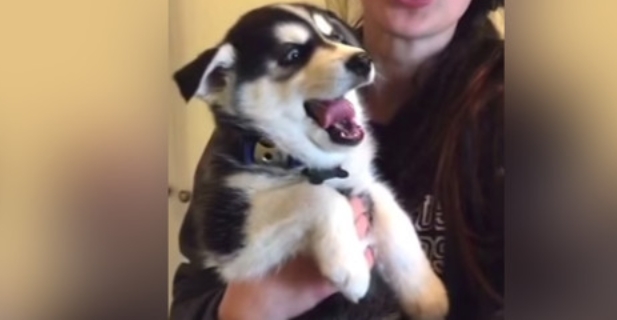 Responses to "Husky Puppy’s Attempts to Speak Will Leave You Laughing Hysterically "